Do you want to make a fashion statement? Well put on a pair of “Cosmic Cowboy Boots” by artist by Jack Armstrong. You will be showing off the Most Expensive Boots in the World. As a renowned American artist around the world, Jack Armstrong is the founder of the revolutionary modern art style named “Cosmic Extensionalism.” Jack Armstrong has actually been painting since he was only 5 years old. At that early age, his artistic talent was obvious. So how would you describe the works of eccentric Jack Armstrong? It’s his own unique and unparalleled Cosmic X style. The style is derived from a combination of extreme textures and colors. As a result, words actually appear throughout each painting. The stunning effect is done by viewing his art at different angles. As a nice twist for those who buy his work, you can actually see his bold signature appear in the middle. A promise Armstrong made is to create just 100 pieces of art in his lifetime. Therefore, each piece has more meaning and he can focus on quality, rather than quantity. The latter often destroys an artist’s career by over saturating the market. Now it’s time for Jack Armstrong to wow the world once again. “Cosmic Cowboy Boots” is his latest creation. At a whopping $6 million, it becomes the world’s most expensive boots. Jack already owned a perfect pair of 1968 Tony Lama boots. Tony Lama boots have long been a popular brand of boots. Interestingly, the boot brand is favored by many U.S. Presidents and actually worn by President Harry S. Truman. With his own pair of boots, Armstrong painted them and the result is amazing. The world’s most expensive boots can be yours for $6 million dollars. It’s obviously not for everybody. But art is often described as a commodity with no ceiling on value. As a result, it’s value and beauty is in the eyes of the beholder. In 2010, the craze began when Jack Armstrong created “Cosmic Starship”. This custom Harley Davidson V Rod initially sold for $3 million in Marina Del Rey, California at at Bartel’s Harley-Davidson. Since that sale, it’s once again for sale for a staggering $15 million. At the Big Boys Toys exhibition, bespoke luxury innovations are available to affluent buyers who live a luxury lifestyle. Items are trendy and a “must have” for those want the best. In 2014 at the Dubai show, Jack Armstrong introduced his “Cosmic Star Cruiser” custom bike for $3 million. For those interested, the Big Boys Toys (now named Amaze Expo) is scheduled this year in London, from August 17-19, 2018. Be on the lookout for 2020. Only 2 years away, Jack Armstrong is planning to launch the world’s most expensive automobile. It’s expected to be priced at an eye-popping $100 million. Do you have something you’ve dreamed of owning? A piece of art, antique car, fashion product or fine jewelry? Contact us today and use our Shopping Wish List service. 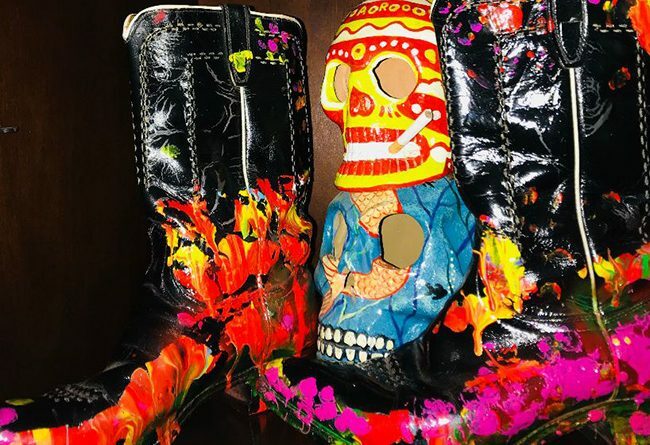 If you are interested in the “Cosmic Cowboy Boots” and owning the world’s most expensive boots, please let us know. We enjoy sharing unique news in the luxury industry. Be sure to follow our blog for the latest announcements.